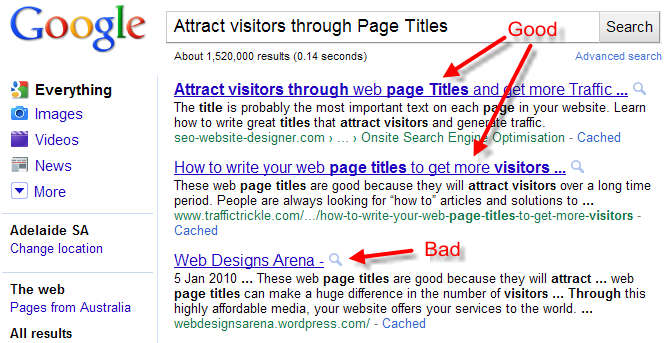 What does your page titles look like in Google? How do I edit my titles? So what makes a good title tag? So what makes a great title tag? Ask Google about your titles! As you can see, the title text is very prominent and becomes you main SEO marketing tool in encouraging people to visit your website. A title that stands out has a greater chance in generating visitors to your website. And that's not all, search engines consider the text inside the title as an important indicator of the content of a web page. So the words you use in the title have a big influence on your chances of appearing in organic search results at all. The title is also used in the tab or window of your browser to show what each page is about. A good title should also ensure the text here is helpful to the user. Your Page Meta Descriptions are also a very important element to SEO. I've also developed a Google Search Result Emulator Tool that lets you test different titles to see how they may look in Google's Search Results. How does Google choose titles? The title text can be defined on every page in your website. Note that this is just a strong suggestion to the search engines on what they should use. It is more likely to be used if they think your title is bo relevant to your pages content as well as what the searcher is looking for. If you use a Content Management System (CMS) to edit your website it will most probably provide a field to enter each pages title. The Google desktop title length limit is 600 pixels, which is hard to equate to characters. I estimate that you can in most cases get 78 characters of a title to show in Google search results, so make sure your message is concise and inside that allowance. You can use more characters but your title may get cropped by Google. try and avoid going too far as over large titles may make search engines think you are spamming them. My Google Search Result Emulator Tool can show you if your title fits in the pixel limit. Every page on your website is a potential advert for you. A common mistake is to use the same title throughout the website. This is a major waste as you could have every page target different market sectors instead of targeting a single one. So every page should have a unique title, and that title should relate to and promote the contents of the page . You should place the website or business name towards the end and if you are marketing to a region, include that too. Titles based on a structure like above are easier to manage and suit many types of websites. However, if you have the time and writing skills, hand crafted titles for every page can't be beat. Make your title call out to the reader "I have what you want". It's your one line advert to sell your page. Combining the targeted keywords to create a compelling call to visit your page can be a great win-win. Cooking Mexican Food? We have 1000's of Chile Hot Recipes! With all marketing for the web, think about what your page offers for the visitor. What benefit will the visitor get. How will it help them. Then write your title to tell them just that. Don't worry about including your company name, unless you are a famous brand, known local business or are trying to brand your website. People are looking for answers. In most cases, the name of the company that provides them is not that important. Also, a Company name generally does not target keywords so in the end its inclusion can be a waste of valuable text space. If you skip your business name in the title then you can always include it in the description. If you serve locally, try and always include the area you serve. If you have the space then you might as well include your business name. As always you should do some keyword research to find out the best words to use in your titles. Google highlights a users search words in the result heading, so it is best to try and include the common keywords related to the page. The highlighted words will attract attention. Google, via their Google Search Console will tell you what they think of your titles. They will indicate if you have any duplicate titles or titles that are of the wrong length or missing entirely. You can also read more from Google on the advice they give to webmasters in creating better page titles in search results.